Hurricanes are the most powerful storms. They have been around for a long time. So if a hurricane is coming your way then you should take cover. Hurricanes form off the coast of Africa and travel towards warm water. Hurricanes are formed over warm water with low atmospheric pressure, this pulls warm moist air towards the surface. Coriolis causes the wind to spiral counter clock wise in the Northern hemisphere and clock wise in the Southern hemisphere. When a hurricane makes landfall it loses power because it is leaving water and the hurricane is powered by water. The hurricane season is June, July, August, September, October, and December. The Saffir-Simpson scale is used to categorize hurricanes. In the Saffir-Simpson scale you categorize hurricanes by their wind speed. The category wind speeds are 1-74 to 95 mph 2-96 to 110 mph 3-111 to 130 mph 4-131 to 155 mph 5-higher than 155 mph. Hurricanes are named after boy and girl names. In the early 1900's hurricanes were named after girl names. In 1979 boy names were added and if the storm was strong enough then the hurricane name would be retired. 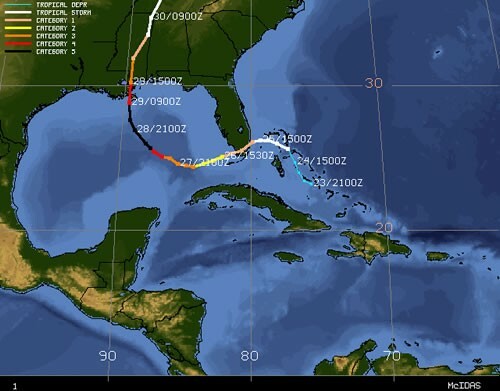 This is the tracking map of Hurricane Katrina. It shows the category of the hurricane. As you can see Hurricane Katrina was a powerful storm. 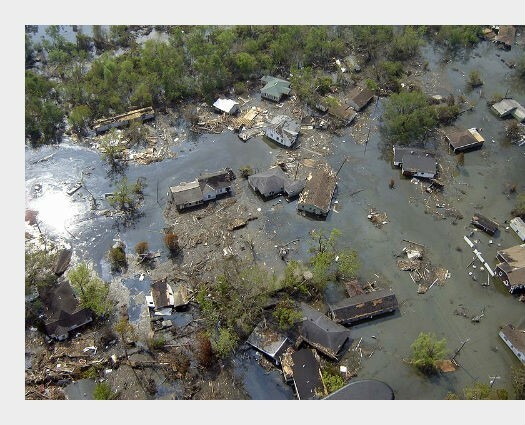 In August of 2005 Hurricane Katrina hit land in the Bahamas, Miami, and went across Louisiana and went into the gulf of mexico. When the hurricane made landfall it was category 3. The highest wind speed of Hurricane Katrina was 175 mph. There was 1200 deaths in Hurricane Katrina and it cost 105, 840, 000, 000 dollars in damage. So when a hurricane is coming your way you should take cover. i hope you have realized how dangerous hurricanes are from this article. Thanks for listening and keep studying hurricanes. This is some of the damage done to a town in Louisiana. The storm left many family's without homes.